It took me months upon months to decide what I wanted to do with the large wall in my family room. I've had the 3-dimensional iron world sitting in a closet for about 6 months - I wasn't sure if it belonged in a den/bonus room or if it could be the focal point of our family room. For most people it would look best in a den, but because of our extensive passion for travel it makes sense to use it as an artistic focal point in a main sitting room. We purchased the ladder back in January. I was very picky with what kind of ladder I wanted and waited until I found the right one. It's taken me all of this time to perfect the ladder and this space. 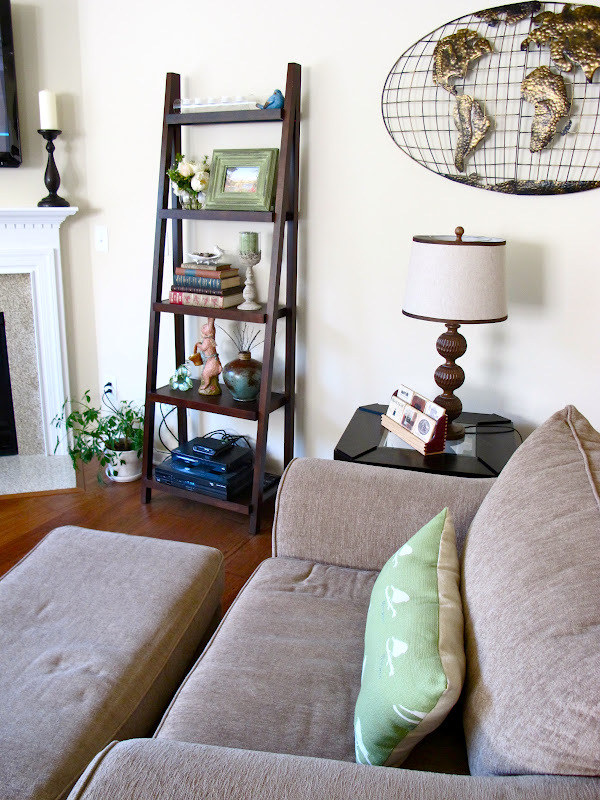 The finished look provides a clean, comfortable and meaningfully decorated living space. love the globe, and it looks perfect there! I have an almost-identical ladder! It looks great! Love how you decorated! Such an inviting room! Love the neutrals and simplicity! The globe is totally fitting considering your lifestyle! Love the books are lovely and i am impressed with your little plant I think I killed a cactus once! THAT GLOBE!!! I don't remember seeing that or I would have stolen it right out of your casa! I love how clean but comfy this space looks! Do share your secret of where you bought that ladder. I want one of those SO bad. The only decent one I've seen is from Target. I love your fireplace...so sleek and pretty. Love that you decorate with things meaningful to your life. Have you ever seen the site www.uncommongoods.com ? They have awesome state pillows which are a little pricey, but it would be kind of cute to have one for CA and one for NC :) Great living room! 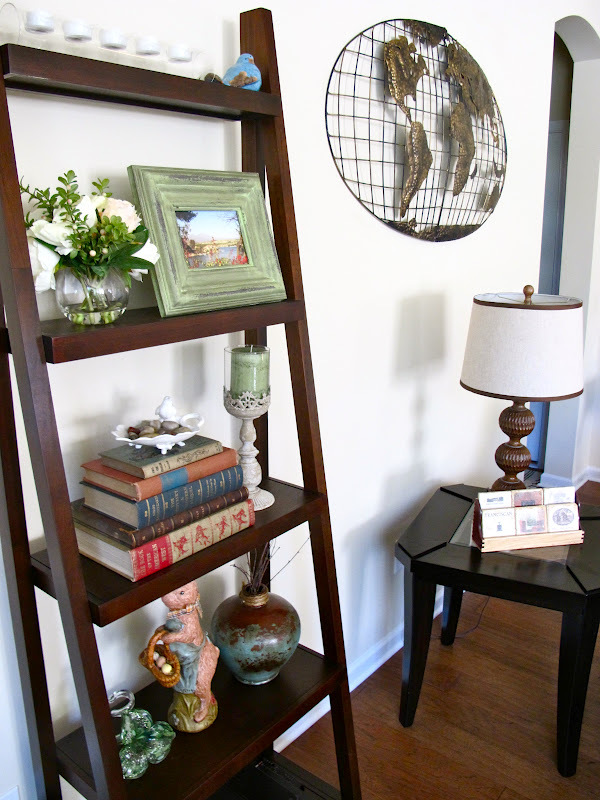 OMG that ladder looks just like the one I'm planning to get...Love it! Your entire space looks very cozy but not crowded, you did an excellent job! Would you like to come to Tampa and decorate my place too? haha! i follow you since now, your blog it's great! OMG! I accidentally removed you from my reader and just realized it! I was wondering where you are and it was my mistake! I have a few weeks to catch up on! i'm pleased to see a picture has been put into the green frame. your house is so stunning. I love how its all put together and looks model-like. Have kids, I SWEAR to you that will change (wink wink) love you!!!!! Love the livng room and especially how you styled the shelves. It's so hard to decorate shelves. I love the ladder! The whole room is great. The whole room looks great.. so inviting! 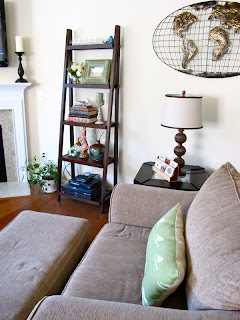 I am a big fan of neutral rooms with little pops of color.